Plants short-stemmed pachycauls, perennial, often flowering after 8-20+ years, monocarpic or polycarpic, acaulescent or caulescent, scapose, forming succulent rosettes on thick, fibrous-rooted crowns, often rhizomatous. Stems aboveground, unbranched or, less often, branched. Leaves evergreen in rosette; blade light green to green and occasionally with lighter patterns of white ('cross-zoned') or imprinted with white ('bud-prints'), linear-lanceolate to ovate, firm to rigid, often thick and fleshy, margins entire, filiferous, or armed with marginal teeth and short to long, sharp-pointed apical spine. Scapes, with inflorescences, much exceeding foliage. Inflorescences terminal atop a semiwoody stalk, spicate, racemose, or paniculate, open to dense, bracteate, occasionally bulbiferous, with flowers borne singly, in pairs, or in umbellike clusters of 2-40+ on peduncles or the lateral branches borne by the peduncle. Flowers protandrous, erect or recurved, showy; perianth mostly yellow, infrequently whitish or reddish, funnelform to tubular; tepals 6, connate basally into tube atop a typically constricted neck; limb lobes erect or curved, equal to unequal in length and/or width, linear to oblong or deltate, often papillate at recurved or hooded apex; stamens 6, exserted, attached atop or within perianth tube; filaments mostly filiform; anthers versatile, linear; ovary inferior, greenish at anthesis, 3-locular, succulent, thick-walled, ovules numerous; style subulate; stigma 3-lobed, glandular, capitate, papillate. Fruits capsular, oblong to ovoid, mostly thick walled and fleshy, dehiscence loculicidal. Seeds black, flattened, obovoid, becoming globose distally. x = 30 (5 large, 25 small). Specimens of Agave are planted occasionally for their horticultural value in warmer regions. Native Americans have used most of our native species for food and fiber. Mescal and tequila are distilled liquors derived from the meristem and leaf base of agave. Tequila comes mainly from A. tequilana F. A. C. Weber, whereas A. angustifolia Haworth is the usual source for 'commerical' mescal. Some variants of A. angustifolia are also important sources of fiber. Commercially, most agave fiber comes from A. sisalana in what is now a worldwide industry. Agave fourcroydes Lemaire is also used but more locally in Latin America including Mexico. Both species are sterile hybrids of unknown origin. Native Americans who used agave plants for food and fiber developed numerous cultivars, including many that may be the results of hybridization or mutation events resulting in fully or partially sterile clones. Some have been sufficiently studied cytologically and morphologically so that the origin of the hybrid species can be ascertained. Naturally occurring hybrids also are known, and some sterile recombinants are so distinctive that they have been formally named (e.g., Agave ×ajoensis, A. ×arizonica, A. ×glomeruliflora, and probably A. schottii var. treleasei). There remain some species that may be of hybrid origin, or at least now are sterile or partially sterile, but little is known about their origin. Essentially, all the species are known today from pre-Columbian agricultural sites, and most appear to have had a Mexican origin (e.g., the many expressions of A. americana subsp. americana, A. decipiens, A. desmettiana, A. neglecta, A. delamateri, A. phillipsiana, A. sisalana, and A. weberi). Some rare species associated with pre-Columbian sites are fertile (e.g., A. murpheyi); whether they were locally selected or brought from elsewhere is unknown. Some hybrid expressions, such as A. gracilipes, seem to be well established. It is a matter of taxonomic judgment whether the species status for A. gracilipes should be altered to hybrid status; we have not proposed that now because the cytological work to confirm the morphological hypothesis of a hybrid origin has not been done. Indigenous people long have used agaves. Those containing high amounts of sapogenins are bitter and generally not used for food. Agave plants used for food are harvested when they show signs of flowering. Rosettes are collected and the leaves cut away, leaving the 'heart' or 'head,' which is pit-baked for many hours. It has been known for a long time that agaves have been cultivated in the warmer regions of North America, but it was only recently discovered that cultivation occurred north of the Mexican border. Such agaves are typically found near agricultural features and possess morphological characteristics that reflect desirable agronomic attributes. People no doubt traded agave products and live plants, thereby expanding the distribution of many expressions of agave. Agaves whose distributions directly reflect their movement by man include Agave murpheyi, A. delamateri, A. phillipsiana, A. applanata, A. karatto Miller, and A. decipiens. It is also suggested that A. americana subsp. americana var. 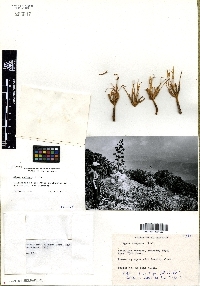 expansa, A. desmettiana, A. sisalana, A. neglecta, and A. weberi may have been ancient cultivars originating in Latin America or the Caribbean, although at present there is little information to support this hypothesis. Identification of Agave species is often difficult, especially with nonflowering material. 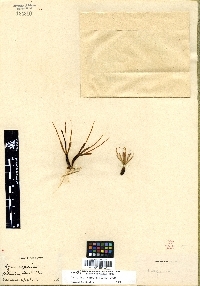 See H. S. Gentry (1982, p. 47) for information on how to prepare specimens properly. PLANT: Perennial scapose herbs, monocarpic, frequently suckering at base and occasionally bulbiferous in the inflorescence, the caudex thick, usually very short, simple or branched, the roots fibrous, hard. LEAVES: in a rosette, generally semi-succulent, firm, spine-tipped, the margins entire, filiferous, or armed with teeth, the teeth large or small, sometimes both large and smaller interstitial teeth present. INFLORESCENCE: terminal, of clusters of flowers, these arranged in open panicles, racemes or spikes. FLOWERS: perfect, protandrous; tepals erect to variously curved, similar or dimorphic, imbricate in bud, united at base into a funnelform to salverform tube; stamens inserted at throat or in floral tube, exserted, the anthers versatile; ovary inferior, succulent, thick-walled with numerous ovules, with a distal sterile portion (neck), this often constricted, the style elongate, filiform, the stigma capitate, 3-lobed, papillate-glandular. FRUIT: a loculicidal capsule, oblong to globose. SEEDS: black. x = 30 NOTES: Ca. 200 spp. ; sw U.S., FL., Mex., Caribbean, C. Amer. ; widely cultivated. (Greek: Agave = noble or admirable). Arizona agaves used for food or fiber include A. chrysantha, A. delamateri, A. deserti ssp. 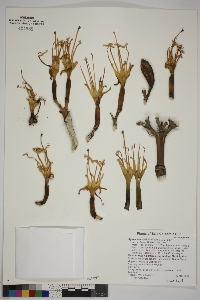 simplex, A. mckelveyana, A. murpheyi, A. palmeri, A. parryi, A. parviflora, A. utahensis, and A. sp., an undescribed agave from the Grand Canyon. Berger, A. 1915. Die Agaven. Jena. ; Brieitung, A. 1968. Cactus & Succulent Journal Yearbook; Gentry, H. S. 1982. Agaves of Continental North America. Univ. of Arizona Press, Tucson. REFERENCES: Hodgson, Wendy. 1999. Agavaceae. Ariz. - Nev. Acad. Sci. 32(1). Tep united below, withering persistent on the capsular, trilocular fr; filaments slender, exsert, with versatile linear anthers; ovary inferior; style subulate, with a 3-lobed stigma; seeds numerous, flat, black; monocarpic acaulescent perennials, ultimately producing an erect scape with an elongate, terminal infl of ochroleucous or chloroleucous to yellow or orange fls; 2n=60, 10 large, 50 small. (Manfreda) 300, warm New World.